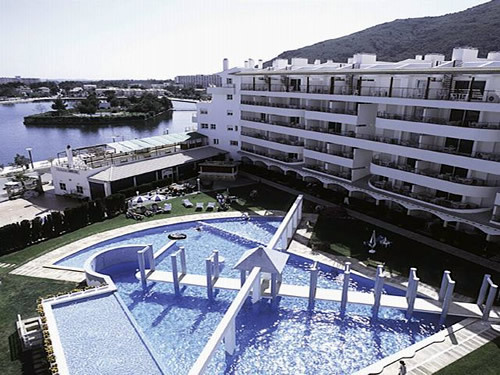 Garden Lago is a fantastic Five Star RCI Gold Crown Resort, situated close to the northern shores of the Lago Major, in the popular resort of Puerto de Alcudia on the north coast of Majorca. The complex is approximately 60km north of the capital Palma and the International airport, and around 1.5km from the harbour and Alcudia resort centre with a great selection of restaurants, bars and nightlife. The resort itself offers a choice of both one and two bedroomed self-catering apartments, set amongst spacious Mediterranean style gardens and sun terraces. All rooms are air conditioned and come equipped with a fully fitted en-suite bathroom with shower, kitchenette with cooking facilities, refrigerator, microwave as basic as well as a spacious dining area with additional sofa beds. The apartments with a terrace have pool or mountain views. Garden Lago complex offers a concierge service to help with trips and activities outside of the complex, but if you prefer to relax on site there is a children's and adult swimming pool, whirlpool, children's playground area, massage services, gymnasium and restaurant, book library, and for your convenience, a car rental service is also available. As this resort is high on our demand list we are looking for certain weeks and apartment for buyers, if you are thinking I want to sell my Garen Lago timeshare then please contact us today.